How to make your own tartar sauce…. This recipe also comes from Ricki via Dr. Kim at Diet, Dessert, and Dogs! I love it dip and mayo! Take Ricki’s and my word for it! This is a great mayo alternative and it is sooo good on tomatoes! See her post here. Recipe Review #2: Healthy! Guilt-Free Key Lime Pudding! Here it is! The recipe that the most of you requested! Key Lime Pie Pudding! I got this recipe from Ricki’s dietdessertndogs website. See the original (almost the same recipe) here. I give her all the credit for this recipe and thank her for it! It is definitely nutritious and delicious! Thanks Ricki! Pour all of the ingrediants into your food processor and blend! Serve immediately! And enjoy! Again, in my search for a good peanut butter product I could handle, I tried this one. I got to say, I like this one more than “Better than peanut butter”. After eating natural peanut butter for so long, I love non-sweetened nut butters. Tastes great and very peanut buttery! What’s inside: PEANUTS, MALTODEXTRIN (REPLACES FAT)**, FAT REDUCED GROUND PEANUTS**, SALT. **INGREDIENTS NOT IN REGULAR NATURAL PEANUT BUTTER. I have struggled with finding something that agrees with me as far as peanut butter goes. I think it’s because I’m sensitive to too much fat at once. Anyway, when I found this, I decided to give it a try. After using natural, unsweetened peanut butter for quite a while, I forgot that regular peanut butter was sweetened. After getting used to it though, I find this to be pretty good. It also has an almost chocolaty flavor. What’s inside: PEANUTS (AS DEFATTED PEANUT FLOUR AND NATURAL PEANUT BUTTER), TAPIOCA SYRUP, PURE WATER, DEHYDRATED CANE JUICE, RICE SYRUP, VEGETABLE GLYCERIN, SOY FLOUR, SALT, TAPIOCA STARCH, NATURAL FOOD FLAVORS, PAPRIKA & ANNATO, CALCIUM CARBONATE, LECITHIN, VITAMINS E & C (ANTIOXIDANTS). 1. Spread it on a pb and honey sandwhich. 3. Make fudge. I have a feeling this would make good pb fudge! With all my posts about “ice-cream” I thought I should post one you can make yourself! I found this recipe and then altered it to yield more, become sugar-free, etc. 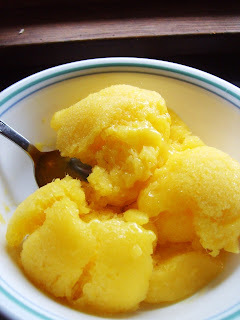 This is a really good refreshing dessert perfect for summer days. Plus, this is the first recipe that I've made sugar-free in quite a while that I had people try and give compliments on. They also could not believe it was sugar-free (refined-sugar free that is ;) )! Prepare your mangoes and set them in a big bowl. Add other ingredients. Stir. Fill your blender halfway full of the mixture. Puree. Pour liquid into another big bowl. Fill blender halfway again and as many times as necessary to get all the ingredients mixed together and pureed. Add them to the other big bowl. Mix with a spoon. Taste to see if it’s sweet enough for you. If not, add more sweetener. I prefer this with agave nectar but you may need to play around a bit with the amount according to your tastes. I know the stevia amounts worked fine for me, but it wasn’t really sweet either. That’s why I suggest you taste. Everyone has their preference which is why it’s great that you get to decide. Anyway, pour into your ice-cream maker and follow manufacturers instructions. This was entered into Amy Green's Slightly Indulgent Carnival (Round One). See it here! The first time I tried these pancakes I found I wasn’t able to get them to be puffy, taste right, or the right consistency. I learned the hard way, that you definitely need the coconut milk and for me some other alterations. Anyway, after some experimentation, this is what worked for me. I’ve made a few slight changes from Lauren’s recipe here. Heat a nonstick pan. If you don’t have one, grease a pan well. Whisk together the egg, coconut milk, and water. Measure out the amount of flours you need and and sift them. If you don’t have a sifter, you can get one pretty cheap at your local Wal-mart, or just use a whisk and get all the lumps out. Add the rest of the dry ingredients. Whisk together until there are no lumps. The batter should be almost like regular pancake batter, thick but pourable. Add the extra tablespoon of water if it’s still too think. Whisk batter again until there are no longer lumps. Pour about half the batter on top the pan at a time, and cook until bubbles appear on surface of pancake. This may take a few minutes longer than normal. Flip and cook other side for about 30-60 seconds. Serve with Earth Balance, peanut butter, almond butter, or whatever you desire! Note: I am experimenting with making a chocolate verision of this pancake (hense the darker pancake on the bottom of this pile) but didn’t get it quite right when I made it, it only had a hint of cocoa flavor. I’ll let you know if I figure out how to make a healthy chocolate pancake . And the final result! My dinner tonight! Ian’s fish sticks with tartar sauce! To make an individual serving of tartar sauce, combine 1 T. mayo with 1 T. relish. *** You may have to play with this to get it to the ratio you like. I like it about equal, maybe with even slightly more relish in it vs mayo. Anyway, mix together. Use fish sticks and dip in! Enjoy! Yum! ***Make your own sugar-free relish using this recipe. Now, are you wondering why I did reviews on pickles and mayo right after my review on fish sticks? That’s because I really wanted tartar sauce tonight on my fish sticks and I decided since I didn’t have any relish to experiment and make up a recipe of my own. Take about 10 baby dill pickles or about half of a regular size pickle and stick it in a food processer with a little of the juice from the pickle jar. Add about 1/4 t. stevia powder to the mix. Process until your desired size for relish. (I got a little too excited and processed mine a little too much). Makes about 1/4 c. Just multiply the recipe as needed. Tastes great! I have searched and searched for organic pickles before I found these. I went without pickles for quite a couple years before I found these. I practically (ok, actually I did) jump up and down when I saw these. Something about regular pickles (the preservatives and additives I’m guessing) makes me sick. And to find organic ones? Boy, it definately made me happy! How do they taste? Great! Although they seem to have a slightly different than your regular pickle, I like them. My sister and mother (who do not eat organic) thought they tasted a little different but I thought they tasted fine. What’s inside (for both) : Organic Cucumbers, Water, Organic Distilled Vinegar, Salt, Calcium Chloride, Organic Garlic Chips, DillWeed Oil, Organic Gum Arabic, Organic Natural Spice Flavors, Garlic Oil, Xanthan Gum. Before the mayo I use now, I bought this mayo thinking that hey, I could save some calories and be healthier and still use mayo. The verdict: YUCK! I hated the taste of this mayo so much that I rarely touched it. I would pretty much rather go without mayonnaise than eat this. I have heard that other vegan brands taste fine, but this one was awful! I bought this mayonnaise a while back and thought I would review it since I use it a lot. Not originally a huge mayo fan, but knowing I needed it for tuna salad, macaroni salad, etc, I bought some. I don’t particularly love this mayo. it is pretty strong (as far as flavor and tang) for me but for you it might be perfect. I find I don’t need a ton of this mayo for the flavor goes a long way! it’s good enough though that I use it when I need it. What’s inside: Expeller Pressed Organic Soybean Oil, Pasteurized Organic Whole Eggs, Pasteurized Organic Egg Yolks, Filtered Water, Organic Honey, Organic Distilled White Vinegar, Sea Salt, Organic Dry Mustard, Organic Lemon Juice Concentrate. Do you have a mayo that’s healthy, light, and a favorite of yours? If so, please share! After my last review and test of one of Ian’s products I was a little skeptical to try this one. I tried it though and actually liked it. I tried two in the microwave, which, weren’t bad. I thought they tasted best and crispiest after cooking them in the oven according to the directions. They were a little greasy but pretty good. I thought they tasted pretty much like the the glutenous versions I remembered. Don’t over cook or they’ll be really crunchy! And for serving size, it showed four small sticks as a serving with about two servings per pack. I think though that they are a decent meal to have on hand if you don’t mind spending over $5 a box!! I’ll be looking into making these myself in the future…watch out for that post hopefully later! What’s inside: Fish Sticks (Minced Pollock, Coated With (Cornflake Crumbs (Milled Corn, Evaporated Cane Juice, Sea Salt, Caramel Color [Natural Color Derived from Corn]) Water, Yellow Corn Flour, Corn Starch, Sea Salt, Baking Powder, Granulated Garlic)). Cooked in Canola Oil. Serve them with: potatoes, fries, or whatever you like! Ever wish you could find out if that recipe is actually good? Yes? Well, you've come to the right place. This starts my first post of recipe reviews. I will note when I follow a recipe exactly or closely and what the results were. The past week, my mother made chocolate zucchini cake for the rest of the family. Knowing that I could definitely not partake of the glutenous, sugar, and dairy laden cake, I started to look for some sort of cake or muffin that I could make and then freeze the leftovers. I found this post and will show it with what I did and the results I got. But all the credit definitely goes to ladybugsandbees! I followed the recipe pretty closely! 1. Preheat oven to 350 degrees. Prepare muffin pan with paper liners or spray with non stick spray. 2. In a mixing bowl, combine flour, cocoa powder, baking powder, baking soda, xanthan gum, and salt. In a second bowl, combine agave nectar, coconut oil, coconut milk,water, eggs and zucchini. Add the flour mixture to the “wet ingredients” and mix well until fully blended. 3. Divide batter evenly between muffin cups, filling each to about 1/2- 3/4 full. Bake for 20-25 minutes. These were really good! I could taste the yummy coconut flavor in them too with the oil and coconut milk. Next time, I want to try them with less fat and sugar etc but I am learning to follow the recipe to exactness on the first try making it . I will update you when I make them again. Also, see her site for just plain chocolate muffins (use 1 c. applesauce in place of the zucchini). I filled these about 1/2 to 3/4 full and then wet my fingers with water to smooth the tops so that they’d be even. They are filling and rich tasting. For an even richer treat, add chocolate chips as she did or raisins. Thanks again ladybugsandbees of gluten-free naturally! The first gluten-free bread that I actually liked! Look how high this rose! True to her word, this bread is nice and soft! Here is a slice of mine, smothered in almond butter and soft enough to eat even with my wisdom teeth just out! **I subbed 1/4 c. agave nectar for the 1/4 cup brown sugar but found it made the bread too sweet. Next time I will put either 1 T. or less of agave nectar. Proofing the Yeast: Mix together yeast, 2 teaspoons agave nectar, and 1/4 cup warm water. Set this mixture aside to proof. It should become aromatic, bubbly, and appear to be “growing” if it’s proofing correctly. In the bowl of your stand mixer whisk together ALL dry ingredients. Whisk or sift ingredients together thoroughly. I whisked together the ingredients after sifting them together. Then I set this aside. In a medium sized bowl whisk together all wet ingredients. Add proofed yeast to this mixture. If your yeast did not get bubbly and aromatic, start fresh with new yeast. Using the paddle attachment of your stand mixer on slow speed, gently pour wet ingredients into the dry ingredients. Mix dough on medium speed for 5-8 minutes. If you don’t have a stand mixer (like me) use a hand mixer. I used the dough with the dough hooks for the blender. Occasionally use a rubber spatula to push dough down the sides of the mixer bowl. While your dough is mixing (or after you finish mixing), prepare your loaf. Carrie notes the dough should resemble a VERY thick cake batter, I found mine to be even a bit thicker, almost like glutenous bread. Heat oven to 200 degrees and CUT OFF immediately. Spritz loaf pan (or pans if you are using smaller 8 x 4 1/2 pans) with non-stick cooking spray or olive oil. Pour dough into loaf pan (or pans — dividing evenly). Spray a sheet of plastic wrap with non-stick spray and gently cover the loaf pan, with the sprayed side facing the dough. Place covered loaf pans in the warmed oven and let rise for 50 minutes to an hour for large loaf pan, or 30 minutes for 2 small loaf pans. The dough should have risen to the top of the pans (but be careful not to let them rise too high).GENTLY remove plastic wrap. Place risen loaf of dough in the oven. For a large 9 x 5 or 10 x 5 loaf, bake 45-55 minutes. For smaller 8 x 4 1/2 loaves bake 30 minutes. Crust should be light brown in color and a thermometer placed in the middle of the loaf should read around 190 for a finished loaf. Take loaves out of pans and place on cooling rack. Let loaf or loaves cool completely before cutting. I store this bread on the counter for 2 days, if there is leftover bread after that point, I refrigerate or freeze remaining slices. Note I don’t leave it on the counter for more than a day, during the summer, otherwise the chance of molding is much higher. Frozen or refrigerated bread slices and be made soft and pliable again by microwaving on medium power for 10-20 seconds. I find this bread very soft and tasty. It is very filling. I made little pizzas even with it. It is more whole grain than most gluten-free bread’s I’ve made and it tastes great almost like “homemade white bread” I used to eat. Want a simple but delicious and filling dinner? I came up with this simple recipe and make this a lot at college. Boil some rice pasta (I used leftover spaghetti and shells). Cook an egg. Place spaghetti over egg. Take prepared pasta sauce and pour it over the top. Add Italian seasoning. Yum! I found a new sections at Wegman’s the other day and was soooo thrilled to find this! I had seen dairy-free mac and cheese or gluten-free mac and cheese but not one with one that was both gluten-free and dairy-free mac and cheese. I haven’t even found a recipe I like so far really that is a gluten-free mac and cheese, so I hoped this recipe would be great since it was especially for kids. I tried it last night. It was not so great! Although I was not trilled at the cost (over $5 a serving! ), I was really excited to try something already prepared that was gluten free and dairy free and sugar free! Amazing! Especially since this is such a classic food that I love. I found the texture to be ok, similar to regular mac and cheese. But, the taste, to my surprise, was not cheesy at all! It tasted like celery to me and was not something I wanted to keep eating. I had tried this because I was sure if kids liked it, I would too. I was very sorely disappointed and frustrated to waste my money on this product. What’s inside: Brown Rice Pasta (Whole Grain Brown Rice, Rice Bran, Water), Vegetable Base, Rice Milk Powder, Water, Cornstarch, Canola Oil, Nutritional Yeast, Sea Salt, Onion Powder, Garlic Powder. Here’s another one for you. I got this because I LOVE peanut butter and chocolate. And this looked amazingly good with its peanut butter fudge looking swirls and chocolate pieces. Overall, it turned out to be pretty good, although not exactly what I expected. Well, it turns out the chocolate pieces are supposed to be chocolate cookies. They taste alright but would be fine left out or I don’t know exchanged for chocolate pieces, or chocolate peanut butter cups!!! Despite the misleading package, there aren’t really any fudge swirls (at least that you can see), it just looks like chocolate ice-cream. It didn’t have much of a peanut butter chocolate flavor. Maybe, a little, but not really discernible. It was pretty good over all but I would definitely choose another flavor next time. It was basically chocolate ice-cream. Still a good ice-cream texture and taste though. What’s inside: Organic Rice Milk (Filtered Water, Organic Rice Syrup Solids, Organic Whole Grain Brown Rice), Organic Dehydrated Cane Juice, Organic Sunflower Oil and/or Organic Canola Oil and/or Organic Safflower Oil, Organic Peanut Butter Variegate (Organic Peanut Butter, Organic Dehydrated Cane Juice, Organic Soybean Oil, Salt, Natural Flavor, Lecithin), Organic Chocolate Cookies (Organic Brown Rice Flour, Organic Dehydrated Cane Juice, Organic Palm Oil, Organic Cocoa Powder, Organic Vanilla, Natural Chocolate Flavor, Sodium Bicarbonate, Lecithin, and Xanthan Gum), Organic Chocolate Flavor (Organic Dehydrated Cane Juice, Water, Organic Dutch Cocoa Powder, Organic Tapioca Starch, Salt, Natural Flavor), Organic Cocoa Powder (Dutch Process), Chicory Root Extract, Organic Tapioca Starch, Organic Locust Bean Gum, Soy Protein Concentrate, Organic Guar Gum, Carrageenan, Xanthan Gum, Soy Lecithin, Natural Flavor, Sea Salt. 1. Place in a bowl and sprinkle on Peanut Butter cups! 2. Peanut butter cookie ice-cream sandwiches! OK, OK! I know! More “Ice cream!” But hey, I what can I say, I really love ice-cream! That, and I lived on it today, as I got my wisdom teeth out this morning. I love mint and chocolate so this was a great combo for me! I loved this ice-cream! It is nothing like “Rice Dream” even though it is made with rice milk. It reminds me sooo much of regular ice-cream. It is creamy, tasty, and just like regular icecream. Plus, it’s not exceedingly high on calorie and fat content. I think this is my favorite “ice-cream” so far! Organic Rice Milk (Filtered Water, Organic Rice Syrup Solids, Organic Whole Grain Brown Rice), Organic Dehydrated Cane Juice, Organic Chocolate Fudge (Organic Dehydrated Cane Juice, Water, Organic Dutch Cocoa Powder, Organic Tapioca Starch, Natural Flavors, Salt, Carrageenan), Organic Sunflower Oil and/or Organic Canola Oil and/or Organic Safflower Oil, Chicory Root Extract, Natural Peppermint Flavor, Organic Tapioca Starch, Organic Locust Bean Gum, Soy Protein Concentrate, Organic Guar Gum, Carrageenan, Xanthan Gum, Soy Lecithin, Natural Flavor, Sea Salt. In the middle of an ice-cream sandwich! Oh boy, what a mouthful! But hey it comes down to this! Allergy-free but yummy Pizza! That has got to be high up there on one of the foods I thought I wouldn’t be able to eat like ever again….or if I did, it would be pretty gross! Not true! I played with a recipe I saw online, and then experimented with the rest of my recipe. One of the great things about this recipe is that it is so easy to change to meet your allergy needs. Only gluten free? Great. Use some “real cheese” and savor it for the rest of us, OK? And you know what!? No matter how you make it, (even with all the ___-free options), it tastes pretty great too! Start by preheating your oven to 400°. Take a 12 inch round pizza pan and spray it with your choice of cooking oil or grease it with some extra Earth Balance. Sprinkle it with extra flour (I used some brown rice flour) and cornmeal. Set aside. Next, grab a medium-small bowl. Add everything except for the extra flour (I used rice flour), “milk”, and cornmeal. Use a pie pastry cutter if you have one, or a fork if you don’t, to combine the mixture. Combine until you have many tiny balls of dough. Add the egg and “milk” to the mixture, and use your clean hands and a spoon to knead it in and form a ball. Flatten you ball somewhat so that it is now a still thick but flat circle. Take your prepared pan, stick the dough in the center, and carefully use your fingers to stretch the dough, covering the pan. Dough will be pretty thin, about 1/4 inch thick. If you are having trouble, wet your hands to lessen the stickiness of the dough getting on your fingers and to smooth out the dough. Repeat as many times as necessary. Place in the oven for 10-15 mins, depending on your oven. It should look slightly cooked when the time is up. While that is cooking, take out a can of tomato paste and either thin it out with one can of water mixed with the contents in a blender or for a very strong flavor and thick sauce, leave as is. After that, take your cheese, whether it be dairy free, lactose free, or the real stuff (I used the lactose free cheese with the tiny amount of caisin in it that is reviewed on my site.) and start shredding it or just slicing it or breaking it apart. Check on your pizza. If it looks like it’s starting to cook, use potholders and take it out of the oven. Add your sauce, and cheese, and any other toppings you woud like, and bake it for another 10-15 mins. Pizza is done when the cheese is melted and the crust is slightly brown on the edges. Bonne Appétit! * For egg-free use egg re placer or ground flax seeds. (1 T. ground flax seeds and 3 T. water stirred together=per egg). I particularly think ground flax seeds would work great in this recipe. **For those of you who can’t consume corn, or don’t have any cornmeal- leave it out. It’s traditional and adds a tiny bit of texture/flavor, but you won’t be missing out on too much if you leave it out. ***I used all Italian seasoning because I often have problems with onions (1/2 t. was called for in the original recipe), and I didn’t have any dried rosemary leaves on me. (1/2 t. was called for in the original recipe) Go ahead and try it with those original spices plus the 1/2 t. Italian seasoning if you like. And although I love spices, the red pepper in 1-1/2 t. of Italian seasoning was a tiny bit too hot for my tastes, but hey I’m kind of a wimp when it comes to “hot”. So if you try it with just Italian seasoning, feel free to use the whole amount or more. Also, the sauce is plain because the crust has so many spices in it! Let us know how your version turns out and what your favorite toppings are! And if you know a good dairy free cheese, let us all know! Any questions or comments are welcome also! Have fun! I’m thinking pizza and a movie night, aren’t you? After not having hot dogs for several years, I decided to give these ones a try. Why? I really liked the fact that these were made with organic grass-fed beef, less fat, and didn’t contain nitrates, sugar, gluten, dairy, or a long list of processed and questionable ingredients. And as far as taste! 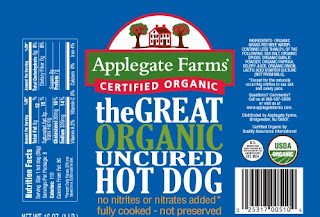 Still pretty juicy, yummy, just like you’d expect a hot dog to taste in my opinion, actually better, because it tastes like real meat, not some, well you know, questionable ingredients. What’s inside: Organic Grass-Fed Beef, Water, Contains Less Than 2% Of The Following: Sea Salt, Organic Spices, Organic Garlic Powder, Organic Paprika, Celery Powder, Organic Onion, Lactic Acid Starter Culture (Not From Milk). 2. Cook it on the stove. Homemade Almond Milk: Delicious, low calories, and low cost! Under a $1 a quart! I recently decided to try my hand at almond milk since I had success with rice milk and wanted to give this one a try. I have purchased almond milk from the store before (and liked it) but $6-7 a quart! that’s a lot of muhlah! I based my recipe of another one I saw online but to make it more cost effective and lower calories/fat, I changed it up. My recipe is about 60 calories or less per cup, and 4.5 g +/- fat per cup. And it’s delicious, sugar free, gluten free, and about 88¢ a quart! This recipe yields about 4 quarts or 1 gallon of almond milk! So are you ready for the recipe? Place your almonds in a bowl. Cover with water. Let soak for about 12 hours or overnight. (I soaked mine for at least 8). Take you almonds and water and place in a blender. Add about 3 cups more water. Blend. Make sure it the almonds are ground up very fine. Pour the result almost like a cream, into a big bowl. Take back one cup of it and add more water (about 3 cups). Blend. Repeat this process until you have about 17 cups of almond milk. You can even just stop after about 5 c. of almond milk that you’ve made and pour 12 more cups of water into the bowl. Mix together. Use your blender and a scoop. Transfer the milk back and forth a couple of times until you think you’ve got the mixture about the same consistency. Strain through a fine mesh and reserve what’s for another purpose. Pour your milk into containers such as Mason jars. Store in the fridge. Shake well before using. (Each time you use). When you get the the end of your milk, you’ll have some leftover pulp again. Strain that out and use it for almond cheese or some other purpose. Note: To make flavored varieties, add flavoring such as vanilla and cocoa and sweeteners such as agave, honey, or stevia. Add about 1 T.- 2T. of agave or honey to each quart. Use 3/4 t. -1.5 t. stevia if you are using that instead (per quart). The original recipe can be seen here. How many of you out there LOVE "Rice Dream" by Imagine Foods? I do! My favorite is original, although I haven't tried chocolate! Anyway, I was thinking about how I could save some money and thought about once again trying to make rice milk. I had tried in the past with OK results but always went back to my good old "Rice Dream". I decided I needed to see what others thought online and I also looked at the labels. After looking at a idea online and reading the label more closely, I created my own version of "Rice Dream." Try it out and let me know what you think! If you try any of the options or make any alterations be sure to let us know! In a large pot, bring 8 c. of water to a boil. Add in 1 c. uncooked brown rice. Add ¼ t. sea salt. Stir. Put the lid on, turn it down, and simmer it for about three hours. Add the safflower oil. Mix. Take it off the heat. Pour in equal amounts of water and into your blender. You will need to do this a couple times. I would suggest that you strain the rice milk through a fine wire mesh or cheesecloth, if needed. Next, dilute your milk to your desired consistency with more water. Blend again. Pour and then store in air tight containers. I like using quart size Mason jars. · Halve or double the recipe according to your needs. · Sweeten with your choice of sweetener if you like. · You may also flavor it with vanilla. · If you choose to make chocolate/carob rice milk, add cocoa/carob and sweetener of your choice. Warning: While this is “lactose free and milk free”, it is not caesin free. It has a very small amount though so if you can tolerate it, you may want to try it. I tried this product and found it was the best cheese substitute I have tried! And actually edible! I liked the mozzarella the best. It had the best closest flavor to what mozzarella tastes like. The American cheese wasn’t as close to what American tastes like and what this version tasted like. I liked them both though. I tried Rice Shreds and found them to be pretty great also. I haven't yet tried the rice topping but I intend to in the future. What’s inside Mozzarella: Organic Rice Base (Filtered Water, Organic Rice Flour), Casein (Milk Protein), Rice Bran Oil, Sodium Phosphate, Contians 2% or Less of Sea Salt, Lactic Acid (Non-Dairy), Calcium Phosphate, Natural Flavors, Yeast Extract (Inactive), Carrageenan, Rice Starch, Vitamin A Palmitate, Riboflavin (Color). What’s inside American: Organic Rice Base (Filtered Water, Organic Rice Flour), Casein (Milk Protein), Rice Bran Oil, Sodium Phosphate, Contians 2% or Less of Rice Starch, Sea Salt, Calcium Phosphate, Lactic Acid (Non-Dairy), Carrageenan, Natural Flavors, Salt, Yeast Extract (Inactive), Carotenal (Color), Vitamin A Palmitate. 3. In a tuna melt! Mmm…I love Soyatoo! Soy Whip! My only complaint is that I can’t seem to ever get all the contents out. It always breaks on me. I would suggest buying the whipable topping instead of the can. 1. Spray some on top of icecream. 2. Use it for your banana split. 4. Decorate a cake with it. This is one of my absolute favorite products! I love these spreads! The taste is very “buttery”! It subs extremely well in any recipe calling for butter or margarine. Original: What’s inside: expeller pressed natural oil blend (soybean palm fruit, canola and olive), filtered water, pure salt, natural flavor (derived from corn, no MSG, no alcohol, no gluten), soy protein, soy lecithin, lactic acid (non-dairy, derived from sugar beets), and beta-carotene color (from natural source). Whipped:What’s inside: Expeller-Pressed Natural Oil Blend (Soybean (Organic Ingredients), Palm Fruit (Organic Ingredients), Canola (Organic Ingredients), Olive (Organic Ingredients)), Filtered Water, Salt, Crushed Soy Beans (Organic Ingredients), Natural Flavor (Organic Ingredients) (Derived from Corn, No MSG, No Alcohol, No Gluten), Soy Lecithin (Organic Ingredients), Lactic Acid (Non-Dairy, Derived from Sugar Beets), Naturally Extracted Annatto for Color. Soy garden What’s inside: Expeller Pressed Natural Oil Blend (Soy, Palm, and Olive), Filtered Water, Pure Salt, Natural Flavor (Derived from Corn, No MSG, No Alcohol, No Gluten), Crushed Soybeans (Defatted), Soy Lecithin, Lactic Acid (Non-Dairy, Derived from Sugar Beets), Natural Annatto Color. 1. Spread it on toast, potoatoes, rice, and pasta. 2. Use it to make toffee. This is probably one of my favorite non-dairy milks that I purchase. I love how it comes out well with recipes. I don’t particularly love drinking it but hey, that’s just me. Also, I don’t notice any difference in taste between enriched vs not enriched. Also, the shelf quality and the refrigerated quality taste the same to me. And a note about vanilla, I don’t particularly like it and find it a little too sweet but for those of you who love vanilla give it a try. I love that it’s not sweetened! What’s inside: filtered water, brown rice (partially milled), expeller pressed high oleic safflower oil, tricalcium phosphate, sea salt, vitamin A palmitate, vitamin D2, vitamin B12. 1. Pour it over cereal. Actually, of all the “Rice Dream Frozen Desserts” this one isn’t too horrible. That’s definitely due to all that chocolate! I love the gooey fudge. I like the good chocolate flavor. But still, not the best flavor and texture for “icecream”. What’s inside: Filtered water, natural sweetener mix (brown rice syrup, chicory syrup), rice mix (brown rice syrup solids, inulin, natural flavors, soy lecithin, salt), expeller pressed high oleic safflower oil, natural fudge variegate (organic evaporated cane juice, water, organic dutch cocoa powder, organic cornstarch, natural flavors, salt, carrageenan), cocoa (alkalized), contains less than 2% tapioca starch, guar, locust bean, carrageenan and xanthan gums, natural flavor. Yuck, Yuck, and Double Yuck! I don’t know about you but I guess I’m just not a carob kind of girl. Plus, combined with the properties of this already not-so-yummy dessert, it just does not taste so good. What’s inside: Filtered water, natural sweetener mix (brown rice syrup, chicory syrup), rice mix (brown rice syrup solids, inulin, natural flavors, soy lecithin, salt), expeller pressed high oleic safflower oil, toasted almonds, carob, contains less than 2% of: tapioca starch, guar, locust bean, carrageenan and xanthan gums, natural flavor.